The less-is-better effect is a preference for the lesser of two alternatives sometimes observed when they are evaluated separately. For example, a dinner service of 24 intact pieces might be judged to be more valuable than a 40-piece dinner service containing nine broken pieces. Pattison and Zentall (Animal Cognition, 17: 1019-1022, 2014) reported similar sub-optimal choice behavior in dogs using a simultaneous choice procedure. Given a choice between a single high-value food item (cheese) or an equivalent high-value item plus a lower-value food item (carrot), their dogs chose the individual item. 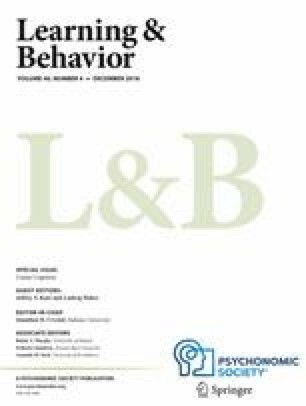 In a subsequent test, the dogs preferred two high-value items to a single high-value item, suggesting that avoidance of multiple items did not cause the sub-optimal choice behavior. In two experiments, we replicated Pattison and Zentall’s procedure while including additional controls. In Experiment 1, habituation of neophobia for multiple items was controlled for by intermixing the two types of test trial within a single experimental session. In Experiment 2, we controlled for avoidance of heterogeneous rewards by including test trials in which a choice was offered between the combination of items and a single low-value item. In both experiments we observed sub-optimal choice behavior which could not be explained by either of these putative mechanisms. Our results, as well as those of Pattison and Zentall, are consistent with the suggestion that dogs’ assessment of the total value of multiple items is based, at least partly, on their average quality.